August 23, Dwayne Coryell and Jules Cross ran into a school of breaking blues on their way to dinner at Harrison's Seafood Restaurant on Tilghman's Island. And aboard the Akula on August 15, we have (from left to right, clockwise) Lana, Joseph, Erica, Stephanie, Alexi, and Ian. 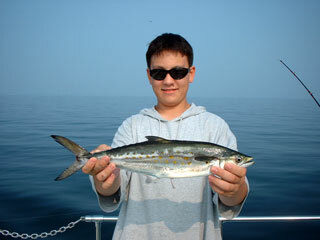 After catching rockfish and blues, it was time to catch some spot. Captain Drew and the crew shown here volunteered their time August 14 to participate in the 14th Annual Fishing for the Needy program, coordinated by the Rod-N-Reel Dock in Chesapeake Beach. And here we have members of a crew from North Bay Distributors on August 12, holding seatrout to 27 inches and a Spanish mackerel. 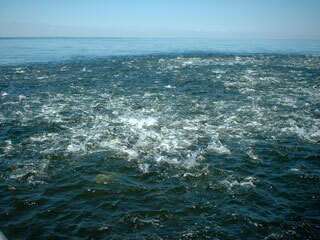 Not shown is a bunch of nice bluefish resting comfortably on ice. Here's the Addie Hill crew from the afternoon of August 11. 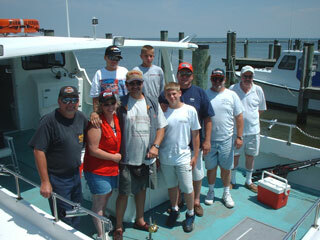 They caught over 60 bluefish, a bunch of Spanish mackerel, and a bunch of rockfish. 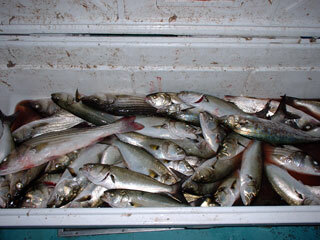 The Hill's catch, quite a good mess of fish. And here we have Rich and Doug, members of the Rich Tyeryar crew of August 10 with a pair of rockfish to 36 inches, quite large for this time of year in our part of the Bay. 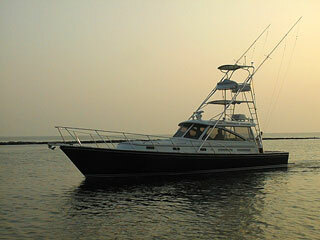 Lev Volftsun had this 45 ft. sport fisherman custom-built in Rhode Island. Powered by three (3!) 450hp. jet-drive diesels, the Akula will push 40 knots. You should see the joystick controls. Captain Drew and Bob had the opportunity to serve as crew on August 08 for a day of fishing. Click here for more. 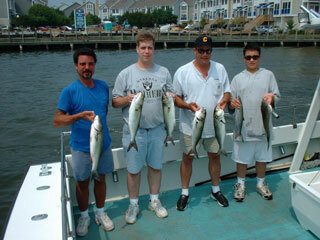 Here we have the Gary Schaeffert crew from August 05 with some of their catch of bluefish and rockfish. From left to right, that's Mark, Bill, Gary, and Jesse. And from August 3 we have the Dave Birkett crew. 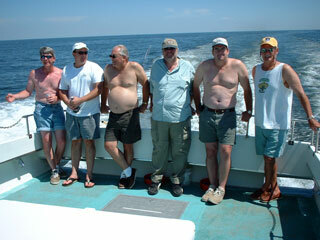 From left to right, that's Bob, Kelly, Mike, Chris, Dave, Mike, and John. Behind, that's Bobby and Lindsey. And from the Cancer Gala at the Rod'N'Reel on the evening of August 2, that's Captain Shawn Pruitt, Sharon Munro, and Captain Drew Payne. 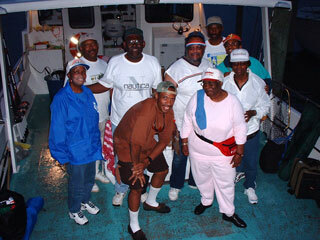 Many of the charter captains volunteer and help out wherever they can. 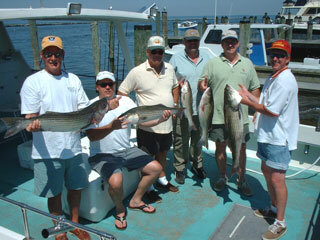 Can you say "wow, that's a load of fish". 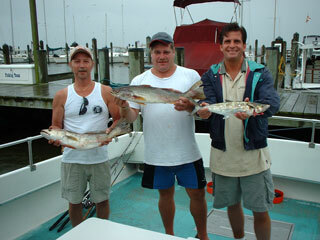 These were rockfish and blues mixed on the afternoon of August 1. 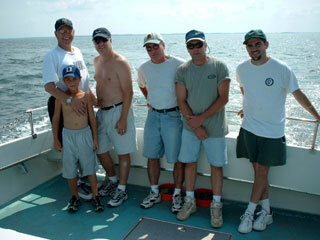 Before fishing on August 1, from left to right, that's Miles, Scott, Hazen Wilson (crew chief), Rob, Matt, and Art. And after, with some exceptionally large rockfish for mid-summer. Art took top honors for the day with a 37 inch beauty.